In Sicily there are three airports. Two main, one in Catania, second in Palermo and the third is in Trapani. If you have booked private transfer, on the day of arrival there will be someone waiting for you at the airport in the arrivals area with card ERASMUS+. You will be taken to BarcellonaPozzo di Gotto by private transfer. If your luggage gets lost, give your baggage claim tags to the responsible officer at the airport. Catania’s airport is almost 2 hour far from Barcellona Pozzo di Gotto. Palermo’s airport is almost 3 hours far from Barcellona Pozzo di Gotto. Birg’s airport in Trapani is almost 4 hours far from Barcellona Pozzo di Gotto. When you arrive in Barcellona Pozzo di Gotto there will be someone waiting for you to show you where EProjectConsult office is and to take you to your accommodation. 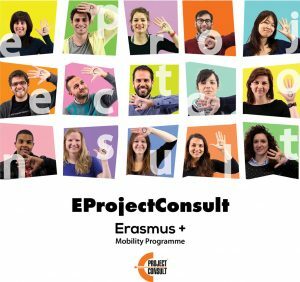 On the second day you will attend a meeting at EProjectConsult office to welcome you and give you the main information regarding your stay and your internship in Italy. After the welcome meeting you will have a small city tour of Barcellona P.G. to get to know the city, and you will be introduced to the companies. 3. Do I need Italian SIM card? You do not need Italian SIM card, you can use your number. When you want to call someone you need to put +39 on the beginning. If you want to have Italian number, there are 4 main companies (TIM, Vodafone, Wind, Tre ) you can buy a SIM card from. Prices differ to some degree, but generally the card itself will cost around 5 euros, plus the package another ~10 euros a month, depending on your demands (for ~10 euros a month, you can get around 2 GB internet, and ~200 texts and call minutes [to Italian numbers only]). Vodafone offers 300 minutes to international number and 3 GB of Internet for 10€ per month. Note that, purchasing a SIM in Italy requires presentation of proper identification, such as a valid passport or European ID card. 4. What should I do in case I get lost? Just ask for the “Duomo”, (the Cathedral) or “Via Roma”, which is the main street of Barcellona P.G., from where you can easily find your way back to safety. You can also use the “Help me!” card if necessary, which you receive during the presentation after your arrival. 5. How I will get to my internship place? When I will get all the information? You will be introduced to the company personally by our staff, where you will have the chance to ask all of your questions. We will arrange your working hours and other rules. Remember to dress up nice and to smile Don’t feel pressure, they are all experienced and looking forward to work with you! According to your choice, we can accommodate you either in one of our flats or in hotel. Flat: depending on the flat, 2-4-6 people can live together. All of them are all fully equipped, with bathrooms, kitchen and possibility to cook for yourself. You can find both single and double rooms. 7. Is there Internet in the flat? If you need, we can also provide Wi-Fi in our flats. This service is not automatically included for the accommodation. 9. What will I eat for half/full board or breakfast? Half board is lunch or dinner in our local restaurants where you receive first and second meal. Full board is lunch and dinner in our local restaurants. 10. Where can I buy food? The main supermarket is called ARD, located near to all of our flats (Via Marconi).You can find many small local shops for bread, sweets or fruits, we recommend you to try them – they are delicious! The shops in Sicily are open from 8:30/09:00 until 13:00 and from 16:00 until 20:30, from Monday to Saturday. Large department stores and supermarkets are open all day. Please, keep in mind, that SIESTA TIME starts at 13.00/13:30 and finishes at 16.00/16:30! During this time most of the shops and markets are closed. Each Saturday morning you can find a big open air Bazaar in Barcellona P.G. In Barcellona P.G. you won’t need a bus ticket or pass if you stay in the city. You can easily walk everywhere in 10-15 minutes. We are going to show you around in your first days to get familiar with the city and the useful shops, services and sights. Also, as the city is small, it is safe as well and they are used to foreigners. Don’t feel shy to ask for help, locals will help you in every way they can. The seaside near Barcellona P.G. called Calderàis 3 kms far from the city center, which is 30-40 minutes’ walk, straight down on one street. You can also take a bus, number 2 at the local bus station (corner of Via Papa Giovanni XXIII and Via San Giovanni). The ticket costs 1,20€/one way which you can buy in the fruit shop named „Fruttivendolo” at the bus station. It is better to buy it for 2 ways at the same time, as the bus drivers can’t sell you ticket on your way back. From 18:30 to 20:30 you can have an aperitivo. For 5-8 euros you will get one drink and a whole plate with different type of snacks. 15. Where can I buy the souvenirs? In Barcellona it is easy to find some local food (biscuits, chocolate, pasta) as souvenirs in the shops. You can find bigger range of choice (postcards, magnets, etc.) on excursions, the main touristic cities have all you can imagine. 16. Where can I find the pictures which you took during my internship?